- it is hardly surprising they were the 2003 winners of Travel Weekly's World's Best Spa. 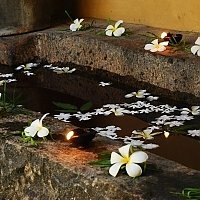 However, ayurveda is regarded very seriously here and the 'spa' concept rather frowned upon. The focus is on the Kur programme comprising diet, massage and detoxification. With only 12 luxurious bungalows, you should embrace the exclusive serenity and luxurious bathrooms that accompany your more discerning treatments. Special treatments range from a three-day cleansing and purifying programme through to 30-day progamme of Pachakarma which claims to eclipse established Western medicines. 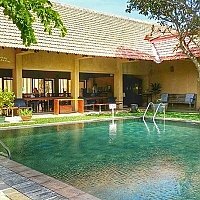 We found the treatments highly rejuvenating albeit a week's stay is really required to maximise the ayurvedic effects. The effects are long lasting and the ultimate feeling of well being is often not fully appreciated until 3 months on. 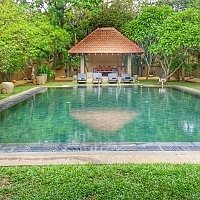 Surrounded by lush woodland and and swaying coconut palms, the ambience is soporific and when not dozing with a massage, one is escaping to the poolside deckbeds. 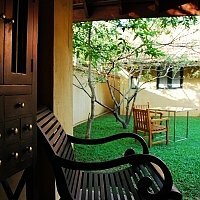 Four resident Doctors and 16 therapists provide about 3 hours of treatment per day for each guest in the privacy of their own bungalow terrace. More specialised treatments are within the health centre. Hatha yoga classes twice weekly were our favourite moment as the mentors attempted to train our minds into meditation - not an easy task. In between treatments, guests may wish to catch the early fishermen pulling in their catch or mending their nets at sundown. The sunsets are quite magnificent. There are 12 spacious air-conditioned villas arranged amongst the woodland each with a private treatment terrace. 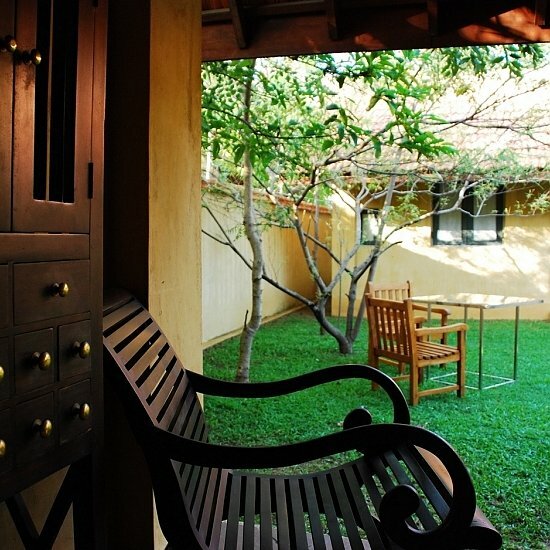 In addistion, there are 16 Classic Rooms and 8 Standard Rooms are located in close proximity to the Ayurveda Centre. 5 King Pavilions and 7 queen Pavilions, designed simply with high timber beamed ceilings and polished cement walls washed with ochre tones, tiled throughout and furnished with locally crafted reproduction colonial dark wood. King size beds are stunning with black and white batik bedspreads of floral design. Terracotta water and flower bowls are placed in each room and glisten in the relections from the large bay windows that open onto a private terrace. The King Pavilions have an open courtyard for private bathing and relaxation. The large ensuite bathrooms have modern white vanity areas and tiled floors. Step out to the open air baths and power showers where you can bathe under the stars or morning sun. Western luxuries such as TV, CD/VCD players, fridges and telephones give you ultimate convenience. Mini fridges will cool your king coconut and water - alcohol should be taken only in moderation during ayurveda treatments. The restaurant only serves Ayurvedic cuisine - fresh vegetables and fruits and ghee to replace usual fats. There is no cold room so all produce is bought daily. Much emphasis is placed on local cuisine - seafood, soups & salads, vegetarian foods and herbal teas, but the comprehensive a' la carte menu serves all tastes. The programme promises relief from chronic conditions such as rheumatism, arthritis, diabetes and obesity. Each guest will receive a bespoke menu in accordance with the doctor's prescription. To help you understand the process, each dish is accompanied by a brief description of its contents, highlighting its remedial properties. I enjoyed a lunch of garlic soup followed by an array of delicious Sri Lankan curries and vegetables served on a ceramic plate within a woven basket. Coconut ice cream and raw coconut and fresh fruit was a wonderful cleanser before I returned for my next treatment. The evening meal was an even greater treat of grilled fish kebabs and vegetable moussaka. The amazing fact is that all this delicious food did not result in one extra pound gained in weight- "You are what you eat!" Morning yoga sessions are a great appetite stimulant for a breakfast of hoppers and Dhal, and fruit. Ayurveda cooking demonstrations are provided for those wishing to practise their new found ways back at home. Dining is in a central open air restaurant, overlooking the flood-lit pool and enjoying subtle lighting and waiter service. The dining room is quite quirky in design and a real respite from the holistic building. Alcohol is offered but not encouraged. The team of Ayurveda specialists will discuss the length and intensity of your programme on arrival and monitor your progress on a daily basis. Each programme is bespoke and can address specific ailments or a general well being programme. Guests can expect around 3 hours of treatments per day. Besides the treatments guests enjoy the relaxation and the swimming pool. The golden mile beach and many wonderful beachside restaurants. Traditional Italian pizzerias feature heavily in Negombo. Sunsets on the beach are quite spectacular and many Christian and Tamil communities will enjoy a family stroll on a Sunday. The communities are very friendly and peaceful. The sea has a strong undertow, so boogie boarding can be fun but be warned! The Dutch town has a lively market everyday and boats cruise the canals selling their produce. Colombo is just a 30 minute journey if you wish to sample the western designer bargains or Pettahs bustling market. Three highly expereinced Ayurvedic doctors meet with the guests to offer their diagnosis of your body type and the most appropriate treament for your stay. Curative or preventative treatments are developed. 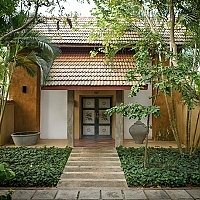 Treatments are given in the private courtyard of your pavilion or within the Ayurvedic Centre. The centre's walls are decorated with therapeutic leaves, dried plants and batik wall hangings. The baths are made from rock stone in the traditional manner. The massage tables are made from mahogany as it absorbs the oils slowly and enables the body to soak up the moisture. The treatments are wide ranging and work on restoring the body's natural balance. The uplifting effect on your health, skin, weight, emotion and any ailments is magnificent.